Get Out On The Water In A Boat That's Perfect For You! 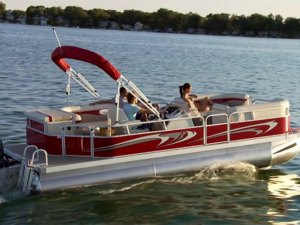 Our pontoon boats are great for lounging out on the lake! Looking for something a little bit more active? Rent a ski boat and enjoy a day of tubing, kneeboarding, wake boarding, or skiing! Our party barges are excellent for large groups and special occasions! Call 512-989-7838 to make your reservation today! 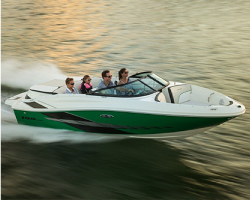 Aquaholics Watercraft Rental is Austin's premier boat and personal watercraft provider due to our focus on providing only quality, new-model equipment at very affordable prices. Our staff is dedicated to making your day on Lake Travis one to remember. My family and I absolutely LOVE Aquaholics! My kids have so much fun out on the waverunners and getting pulled behind a tube, and I love the prices! Aquaholics has always had amazing service and quality. We wouldn't go anywhere else! Last July we (NOV) rented a party barge from Aquaholics, and I have to admit the experience was one to remember. The captain was very professional, he even help setup our food and drinks. After we left the establishment 3 of our guess showed up late and the captain called the office and had a shuttle bring them to our location. After a few hours some of our guess couldn’t stay for the entire event, so the owner sent out a shuttle to pick up anyone who had to leave early (Outstanding) Our Company have rented from Aquaholics in pass and will continue to rent from them in the near future. Aquaholics was the venue for my rehearsal dinner a few years ago. We brought in some catered food and Mike and the crew took care of everything else. They were super accommodating to all my guests, which included some older folks and my handicapped uncle. We cruised around and watched the sunset over Lake Travis. Talk about a stress free event--I highly recommend Aquaholics! Easy company to work with, competitive prices and always a fun time on the lake! Aquaholics! What a FABULOUS afternoon from beginning to end! We rented the double-decker party barge for my mother’s 70th birthday party! What a blast! A special shout-out to you and your staff! The services were exceptional! From unloading our vehicles, shuttling us to the barge, helping us decorate, blowing up our floaties, to helping us clean up our mess! The Captain of our barge even grilled the burgers and hotdogs for us!! Our party goers ranged from 2 year-olds to 80 year-olds, and your staff was not only polite and friendly to each and every one of them, but treated them with respect. In turn, they had a fantastic time during the excursion! One staff member in particular, a young man named Gabe, was extremely helpful assisting the older party goers on and off the barge. 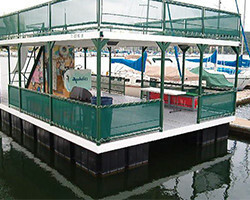 We will definitely recommend Aquaholics to those looking for a wonderful time on Lake Travis. We rented a party barge from Aquaholics and couldn't be more pleased! The staff and captain are professional and very courteous to us and all our guests. The barge was the perfect size and in great condition. Will definitely use them again! My wife and I rented a wave runner for our 30th anniversary. We've been going out on Lake Travis for years, but have never had the quality nor customer service that we received from Aquaholics! My family and I have been going to Aquaholics for years. The facility is always kept clean, and they've always been very accommodating to our needs. They even have a life jacket that fits my 18 month old! We rented speed boat from Aquaholics last Saturday, the staffs are very easy going and helpful! It was a great time to spend it on Lake Travis, will definitely come back soon! We had a great time on the party barge with these guys. Super easy to work with and the staff is extremely friendly. They grilled all our food that we brought, I would definitely recommend them and would use them again when planning a good time on the lake! We went out on a Ski Boat for a half day rental, and also got a tube. We had a blast! The boat was clean, and the staff was friendly. They had our boat full of gas, the tube already on it, and sitting at the dock waiting for us when we got there.